New Delhi, April 13: Little did Delhi police officials know what was ahead of them when they reached Delhi's Mayapuri area to seal illegal scrap factories following an NGT order. 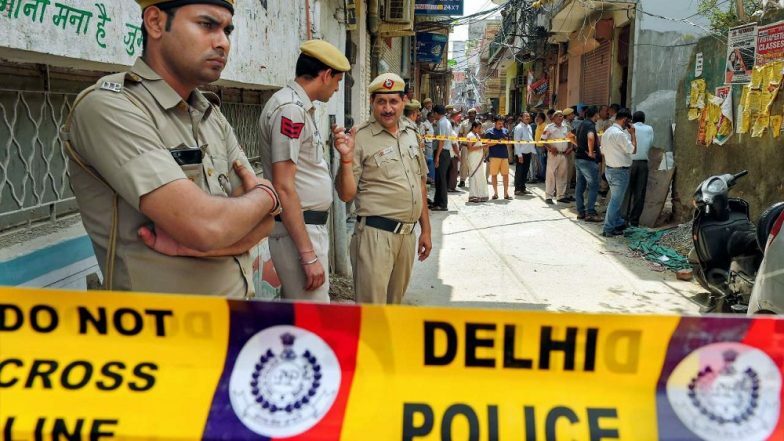 Clashes were reported between locals in Delhi's Mayapuri and the police officials who visited the area. Lok Sabha Elections 2019: Arvind Kejriwal Warns People Not to Vote For Congress, Says Give All 7 Seats to AAP. A video put up by news agency ANI shows security forces chasing down protesters. Stones and bricks were thrown at the men running on a road in the area. AAP Still Open to Alliance with Congress in Delhi, Haryana and Chandigarh for Lok Sabha Elections 2019. The Aam Aadmi Party (AAP) tweeted on the incident by sharing the video on Twitter and wrote, "Horrifying!!! General Dyer Modi's police brutally pelting stones on the citizens in Mayapuri, Delhi." April 13, 2019, marks the 100th anniversary of the Jallianwala Bagh massacre in which British India Army General Reginald Dyer ordered his soldiers to shoot at unarmed crowd. The incident resulted in over 1500 people injured out of which 1000 died who are remembered as martyrs today. Delhi chief minister Arvind Kejriwal also tweeted and said that while the BJP government is helped by "traders who give them their vote and money, the BJP has shown by this incident that they don't want the votes of the traders."